Marriage is all about blending. Ideals, perspectives, personalities, lifestyles … leaning into each other and complimenting each other’s unique attributes. And speaking of blending, I’ve always loved the idea of using special tea blends as wedding favors. It’s easy to create an attractive gift package to place at each setting or display in a “take one home” basket. Caution: Be sure to gift a tea that’s trusted and not from an import warehouse. Lover’s Leap, from Portland favorite, Smith Tea, is a perfect choice. Fragrant rose petals in black Ceylon accented with chamomile and citrus. You get 15 sachets per box individually sealed in a large (4″ x 2.5″), decorative foil lined wrapper. Want to take your wedding tea to the next level? Read my post about having Smith do your packaging and/or custom blend your wedding day tea. Here’s to happy blends everywhere! From the invites to the centerpieces; from the gold painted signage to the 7 dozen chocolate chip, lemon and coconut biscotti she baked for guest favors; this bride’s attention to detail was a wonder to behold. 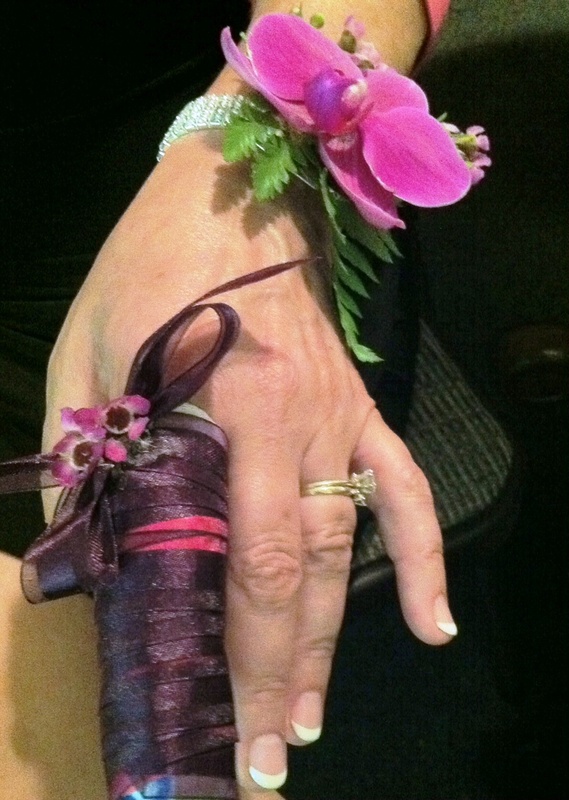 The groom agreed citing her “magic touch” that made it all happen. And what fun for everyone! Nona and Jeromie chose McMenamins Edgefield Estate for their destination wedding held yesterday in Portland. Family and friends from HI, WI, TX and GA were on hand to enjoy the weekend celebration, many of them staying on site. The garden setting was perfect for the ‘Northwest country meets tropical isle’ theme. The palette carried out in straw fans; shades of peach, pink and coral for the bridesmaids and floral bouquets; and the men in tan linen suits. Vintage Hawaiian postcards were placed in a fishing basket after guests wrote their well wishes. Bubble guns and mini-bubbles for the guests added smiles to the ceremony as did the tree planting ritual. Guitarist and DJ, Michael Blake (a local favorite), provided the music for the event. After the ceremony, guests enjoyed cocktails and brews in the courtyard (along with a cigar bar) followed by a lavish buffet dinner featuring barbequed chicken and coffee barbequed brisket. Reception highlights included a serenade of At Last by the bride’s cousin and the newlyweds showing off their dance moves (those classes really do work). The couple will honeymoon in Maui before returning to their new home in Seattle where Nona starts nursing school in the fall and Jeromie is a surveyor for the State of Washington (squeezing in flying lessons when possible). Congratulations, Mr. & Mrs. Hunter. May the sweetness of your wedding day remain in your hearts forever. Mahalo! Gorgeous weather for whale watching and viewing the full moon set a perfect stage for Saturday’s wedding of Erika and Ruben. 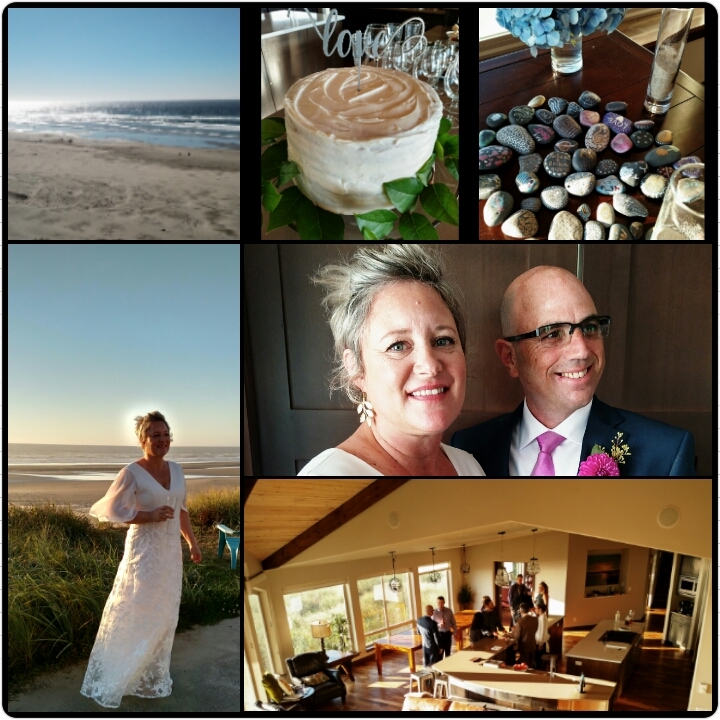 The Portland couple rented a spacious beach house in Seal Rock and invited their closest friends and family members to join them for a 3-day celebration. The intimate ceremony featured a poem composed by the groom’s father and a sand exchange ritual using sand collected by the couple earlier in the day. The altar was decorated with flowers, a handcrafted photo mobile and colorful stones painted by the guests. After the celebratory toasts and hugs, the wedding party traveled seven miles up the coast to enjoy dinner at the popular Local Ocean seafood restaurant on the Newport Bay marina. This was such an interesting mix of global influence. The groom’s father was from Argentina, his mother was from France. He was born in California. The bride’s mother was from New York. She was born in Canada. Is it any wonder that these two LOVE to travel? They plan a tropical honeymoon in November. Meanwhile, they reside and work in PDX where Ruben is a physician with Providence and Erika is a project manager. Congratulations, Dr. & Mrs. Halperin! May laughter and love be constant companions wherever your travels lead. The biggest challenge with having little ones in or at your wedding is keeping them entertained. Kids get understandably antsy – all that hurry up and wait! Being seen and not heard while the bridal party gets dressed, photographs get taken, guests arrive … that’s a LOT of being on your best behavior. I’ve seen all kinds of attempted “wedding kid control” over the years. The BEST solution? Keep them occupied. If you don’t have the luxury of a relative or friend who can be a Mary Poppins on site; provide age appropriate activities so they can entertain themselves. Books, puzzles, hand-held games, disposable camera, mini-water bottle, clear gummy worms … items that are noise and mess free. Putting it all in a customized tote makes it portable and special. 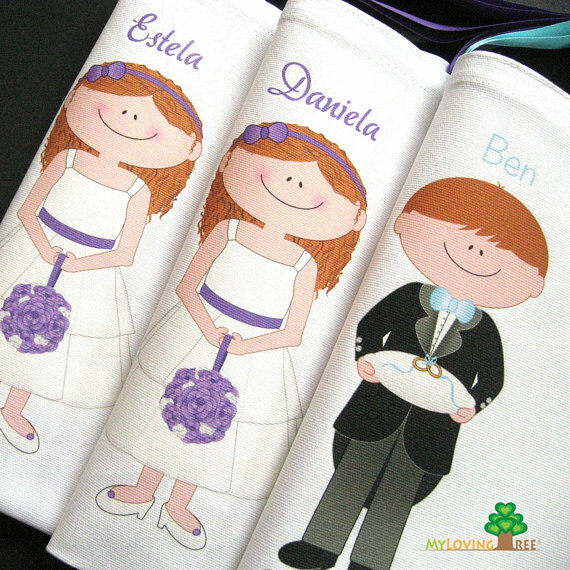 MyLovingTree from Portland, OR makes adorable canvas bags with lots of custom features. In addition to personalized names, you can select skin tone, hair color and outfit. Lots of options for bridal party gifts, too. Check them out on Etsy. Clear skies, a lush garden setting, bridesmaids in plum satin and groomsmen in gray … what a lovely wedding celebration last Saturday at one of my favorite PDX venues, Leach Botanical Gardens. Teirnie and Zach exchanged vows under the courtyard arbor during the 4:00 ceremony. 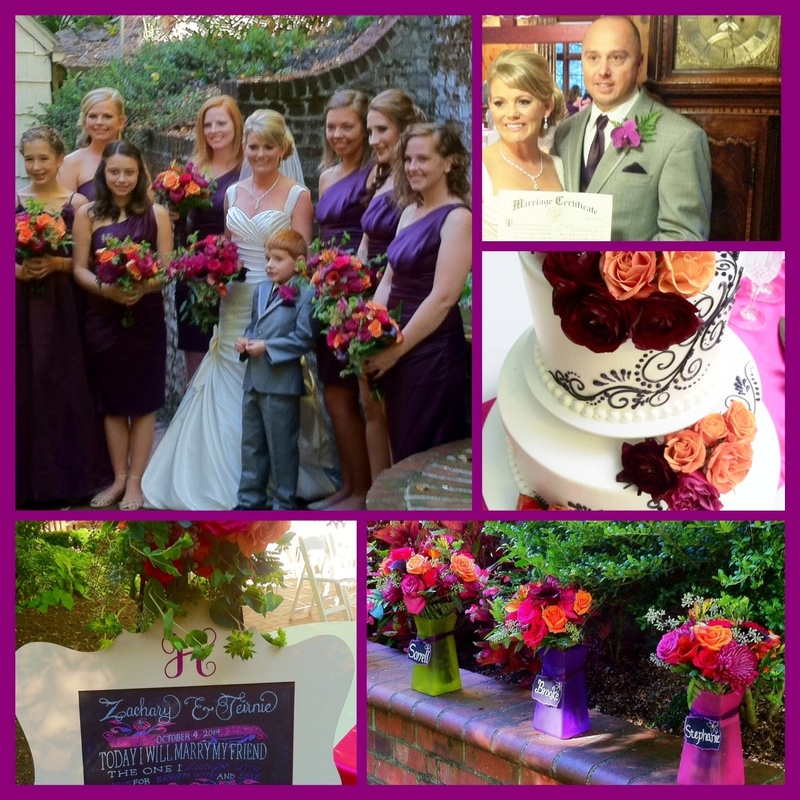 Truly a family affair; the bride was presented to the groom by her uncle, her five year old son, Beckham, participated in the unity sand ritual and the groom’s mother, Linda, made all the exquisite flower arrangements in the theme colors of plum, magenta and orange. DIY extra nice touch: Bridesmaids were gifted with a memento frosted glass vase to keep their bouquet fresh. Guests were treated to music by No Talk Tunes while enjoying a delicious dinner buffet and took home a gift of Pure Wildflower Honey compliments of the bride and groom (and the bees of Leach Gardens). Congratulations, Mr. & Mrs. Hemelstrand! May all your days together be as lovely as the energy of Saturday’s celebration. NOTE: Kudos to Linda Hemelstrand for recovering from a zero hour accident with style. She sliced off the tip of her finger while working on the wedding flowers and had to go to ER the day before the wedding!